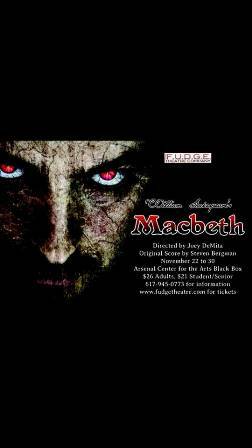 Joe DeMita is one of the founders of The F.U.D.G.E Theatre Company, Inc. He graduated from Stonehill College in 2005 with a degree in Psychology. Directing credits include Jake's Women (Stonehill Theatre Company), Company (Winthrop Playmakers), and the F.U.D.G.E. productions of Once On This Island, Working, Rumors, Urinetown, Dedication or The Stuff of Dreams, I Sing!, The House of Blue Leaves, and, most recently, Into the Woods. Joe has also served as the directing intern to Rob Ruggiero at TheatreWorks Hartford on productions of The Exonerated (featuring TV/Film star Kim Fields) and the world premiere musical Ella: Off the Record (starring Broadway's Tina Fabrique). In the Boston area, Joe served as the assistant director to Adam Zahler on the Lyric Stage's production of Talley's Folly. F.U.D.G.E. Music Directing credits include Urinetown, Working, A New Brain, and Once On This Island. Joe recently began working at Runkle Extended Day in Brookline as a teacher and coordinator for the 3rd/4th grade program. Tina has loved the stage since she started dance lessons at age 5, but it wasn't until college where she discovered the world of theatre. A friend got her involved in the Stonehill Theatre Company, and it was there that she was lucky enough to meet the soon-to-be F.U.D.G.E. crew. Finally embracing her inner "theatre person", Tina joined F.U.D.G.E. as the Artistic Consultant of A New Brain in 2003, and has been serving as Secretary of the Executive Board since its creation in 2005. Tina graduated from Stonehill College in May 2005 with a B.A. in History and currently teaches Technology at the Susan B. Anthony School for the Arts in Revere. She is also working toward a MA in History at Salem State College. Tina's favorite on-stage moments include A Funny Thing Happened on the Way to the Forum at Stonehill College, and playing Cassie in F.U.D.G.E. 's 2005 production of Rumors. Favorite off-stage moments are far too numerous to count, but include co-producing Urinetown: The Musical, co-stage managing I Sing!, and acting as Production Stage Manager for The House of Blue Leaves, Into the Woods, and Bat Boy. Tina believes that F.U.D.G.E. is truly a fun group of friends who are united developing genuine entertainment, and hopes to be with this fabulous company long into its bright future! Samantha began her involvement with The F.U.D.G.E. Theatre Co. during the summer of 2004 performing in Once On This Island. After that first experience, she was hooked. She continued on with F.U.D.G.E. performing in such shows as 'Dentity Crisis, Louder I Can't Hear You, Working, Urinetown: The Musical, and this past season's The House of Blue Leaves as Corrina Stroller. She has also been a member of the company's executive board since May 2006. Samantha graduated from Salve Regina University with a B.S. in Business Administration in 2006 and is currently working for Amergent, a marketing company in Peabody. Samantha has been involved with performing arts since age of... well since very young. She is so grateful to be able to continue performing and participating in theatre even after entering the very boring "real world" of being a grown-up. Samantha has made so many incredible friendships due to her involvement with F.U.D.G.E. and could not ask for a better cast of characters. F.U.D.G.E. truly does live up to its acronym, through and through! Kacee has been a fan of the theater since first seeing her big brother star as "Willy Wonka" in his fifth grade production of Charlie and the Chocolate Factory - some twenty years ago. While her brother has since decided to put his acting talents to use as a lawyer, Kacee has carried on in the theater world – and could not be more pleased to have a place to do so, alongside the wonderful folks of F.U.D.G.E. A graduate from Stonehill College, Kacee was an active member of the Stonehill Theatre Company, and has worked on nine productions with F.U.D.G.E. since first performing in A New Brain in 2003. She now works as Executive Director and Assistant Repertory Acting teacher for the Todd G. Patkin Operatunity Performing Arts Center. Some of Kacee's favorite acting credits include: "Bananas Shaugnessy," in The House of Blue Leaves; "Little Sally" in Urinetown: the Musical; "Chris Gorman," in Neil Simon's Rumors; and "Protean," in A Funny Thing Happened on the Way to the Forum. Ask anyone who knows AnneMarie and they will tell you that she is a self-proclaimed proud theatre dork. This passion began circa age 3, during her stage debut in The King and I. While she was only in approximately 10 minutes of the show, she could and would perform it in its entirety. She held daily shows in her car-seat, her room, the bathtub, anywhere, really. Her love of theatre only grew when she discovered that there was more musicals than The King and I. At age 8, she announced that she would be attending Emerson College. (They played showtunes on the radio! Was there any other choice?) She achieved that goal, and graduated in 2006 with a BA in Theatre Education. That summer, she joined F.U.D.G.E. for our production of Urinetown; and has since been seen in Into the Woods, Bat Boy, and I Love You Because. While her home truly is onstage, AnneMarie also enjoys working on more covert projects, such as, scouting props, cutting costume patterns, and assisting in the management of the stage. When not doing something F.U.D.G.E.-related, she teaches at Kidstock Creative Arts center in Winchester, coaches voice and piano, and can usually be found cooking, eating, reading, and watching bad reality tv. Kaitlyn MacPherson has been an active F.U.D.G.E. enthusiast for several years. Not only has she been seen in last fall's dramatic masterpiece Dedication, or The Stuff of Dreams, as Jessie, and in our summer 2005 production of Working as Lovin Al, but she has also been the makeup designer for several of our productions to date! It was Kaitlyn's hand that made the gruesome witch in our production of Into The Woods, and her magic that turned our Bat Boy from a handsome man to a frightening half-beast. Kaitlyn also offered her expertise to our production of Fuddy Meers, turning the Limping Man's perfect ear into a twisted mass of deformed scar tissue. Kaitlyn acquired her many skills as a Theatre major at Stonehill College, where she also obtained her bachelors in Criminal Justice in 2005. When Kaitlyn isn't acting on the stage or creating fabulous looks for her fellow actors, you can find her at the Waltham Police Station where she serves our community as a police officer. She enjoys a plethora of activities including show choir, beading jewelry, making her own custom t-shirts, and spending time with her dog, Daisy.